The Cargo Vessel “Ocean Giant” gliding into the docking area that the icebreaker “Polar Star” had cleared out earlier. The Polar Star can be seen in the background. Snap shot of the misguided missile being fired that bounced off the hill and is flying over the power line towards the dorm buildings. We were standing in that area just minutes before. Today all of McMurdo was in a frantic mood. The cargo vessel was due to arrive. In preparation, large areas were closed off for cargo container storage overnight, specifically the area between building 155, where the galley is located, and all the dorm buildings. It was quite a surprise when we got up this morning that we couldn’t go our normal, direct way to the galley (meaning to the food) anymore. In addition, the way to Hut Point is now closed as it goes by the ice peer, and so Scott and I have to find a new running route. 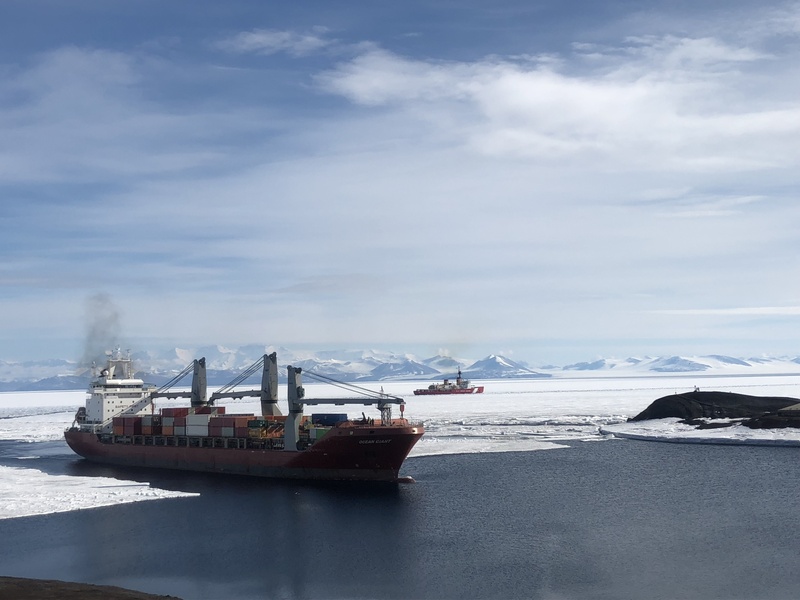 And the arrival of the cargo ship also means that all of McMurdo is going dry now, meaning no alcohol permitted anywhere for at least a week or so until the ship is unloaded and reloaded. The only 2 bars in McMurdo are closed (well at least they don’t serve alcohol anymore, the barracks are still open), the only store here doesn’t give out alcohol rations anymore, and everyone starts on working on 12 hour shifts 24 hours per day until all the work is done and the cargo vessel departs. The vessel carries all the supplies that McMurdo needs for the entire next year, including the upcoming winter season. Crazy. It also takes cargo back from McMurdo. So there was a lot of fussing and running around going on. The ship was due to arrive at 2pm, so after a nice lunch we headed out to the Ob-Hill loop track (since Hut Point is closed) to get to higher grounds and look for the incoming vessel. Our old friend the icebreaker “Polar Star” was guiding the cargo vessel into McMurdo Sound, re-breaking the ice, and clearing the channel it had cut earlier in the season. And finally the cargo ship glided into the docking area at 4pm. 2 hours late! At that point we were pretty much frozen. But it was worth it. The ship with its 3 massive cranes and all the cargo containers on board is really impressive, the ice peer looks quite whimsical and thin compared to the ship’s size. But the most interesting thing was how the vessel got docked. It shot 4 missiles (two from the bow, and two from the aft) over the water towards the land that carried long ropes that then got tied to poles. We were all outside watching in front of our dorm buildings which face the ice peer. But the poles are also located in front of the dorms and so we all got evacuated and weren’t allowed outside right before the missile launch. We watched from the dorm lounge instead, which is so much warmer than the outside. To our delight, one of the fired missiles was misguided and bounced off the hill and shot right up towards the dorms, over the power line, and finally came to a stop when hitting some pipes between dorm buildings. It was awesome to watch but I was so very glad that we were not standing outside anymore. Those missiles are freakin fast! The people in McMurdo are like MacGyver and pretty quickly the problem was resolved and the cargo vessel finally secured. Now the unloading craziness has started and we try to stay out of the way as best as we can. On a good note, we totally are taking advantage of the empty bar tonight and maybe get a chance to finally play pool since the one pool table is always blocked during normal (non-dry) bar hours. We are hoping that tonight, as the first “dry-night”, it will be different. Wish us luck!